The Vila Gale Marina occupies one of the premium locations in Vilamoura, a stone’s throw from the bustling marina, where you will find a vast array of popular bars and restaurants. Of course, the local courses are the main event, there are such an array of championship courses around Vilamoura that you are spoilt for choice. Dom Pedro Pinhal and Dom Pedro Millennium are among the most popular options. The hotel, only 25 minutes from Faro Airport, offers stylish and comfortable rooms, often with views over the marina or beach, as well as a host of on-site facilities. Although you can kick back and relax at the pool or hotel bar, the highlight is its proximity to the local features of the Algarve's top hotspot, with the beach, marina and casino all within a few minutes walk. The accommodation is comprised of 240 rooms, all of which have a private terrace or balcony, in addition to air-conditioning, satellite television, direct dial telephone, safe deposit box and lovely modern furnishings. Basing yourself at the Vila Galé Marina will ensure that you are in the heart of the action in the famous resort town, making it the perfect choice for your next golfing holiday. The Vila Galé Marina has an outdoor swimming pool and jacuzzi, as well as a Turkish bath, gymnasium, games room and kids club. The hotel's Galeo Restaurant is a relaxed dining room, serving a great variety of international cuisine. room was clean and tidy, cleaned daily. room location was very good, only a few yards to lift, on the third floor. everywhere was always clean and tidy. Staff very helpful. The new system for arranging for taxi to the golf course worked very well, always around ten minutes. We have used them many times over the last 20 years.Convenient location. This was a 4 star hotel years ago but is now a 2 star. Breakfast was woefull. Rooms are Run down. Had a problem when we arrived with 3 people in a twin room .Will not be back. 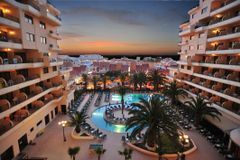 This hotel is in the perfect location for Vilamoura marina and all the bars and restaurants. clean and tidy and staff look after you. Very clean friendly staff nothing was to much trouble. Facilities were very good , golfers friendly. Very close to marina with excellent bars restaurants and entertainment, have used hotel 4 times never disappointed. 5 min walk from the Marina where ther were plenty of restaurants & bars. No issues with the hotel and would happily return. Friendly informative reception staff,clean and well run hotel in a good location close to marina . Will use it again. Good clean rooms but bath set up a bit weird . Fridge in room only has water and very expensive no tea/coffee facilities . A quick note to thank you for organising what was a fantastic trip last week. The level of service all the way through from your golf travel, to the fantastic Vila Gale Marina Hotel, and all 3 golf courses was superb. The drivers never let us down either and were second to none so we’ll definitely be booking again next year. Thank you for your great organisation for our Vilamoura trip on 19th May. It suited us perfectly. We played the Oceanico Laguna, Millenium and Pinhal courses and all were in good condition with Pinhal being by far the best. We enjoyed great hospitality at both Laguna & Millenium clubhouse. It’s a pity Pinhal don't have a balcony overlooking the course in the sun though! The Vila Gale Marina hotel is excellent value for money. It’s very clean, there’s a great buffet breakfast selection and we ate there one evening and food was very good. Rooms were comfortable and were available to us well before the normal check-in time which was a sign of great service. Vilamoura itself is the ideal hotel location for a golf holiday in the Algarve. We were able to walk into the town for dinner in the evening where there’s an abundance of good Portuguese restaurants delivering tasty, well priced food. Our overall verdict would be 8 out of 10 and we would definitely re-visit. We had yet another great Vilamoura golf holiday, seamlessly organised by YGT. We played three of the Oceanico courses: Pinhal, Laguna and Millennium. The greens were a bit spongy on Pinhal but the other courses were great for a group of mid-handicappers. The Vila Gale Marina was spot on. The hotel facitilites and food were great and golf transfers were all spot on. We enjoyed some great weather and there are plenty of bars and restaurants within five minutes of the hotel. We had a really good trip!